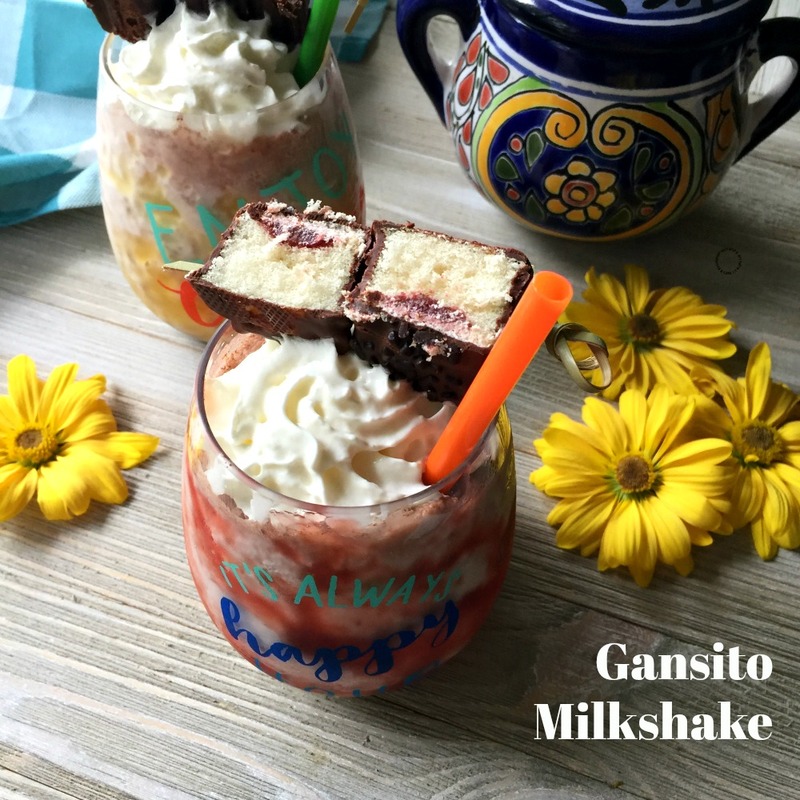 Cheering with Mexican Milkshakes while Reminiscing on Childhood Favorite Treats! 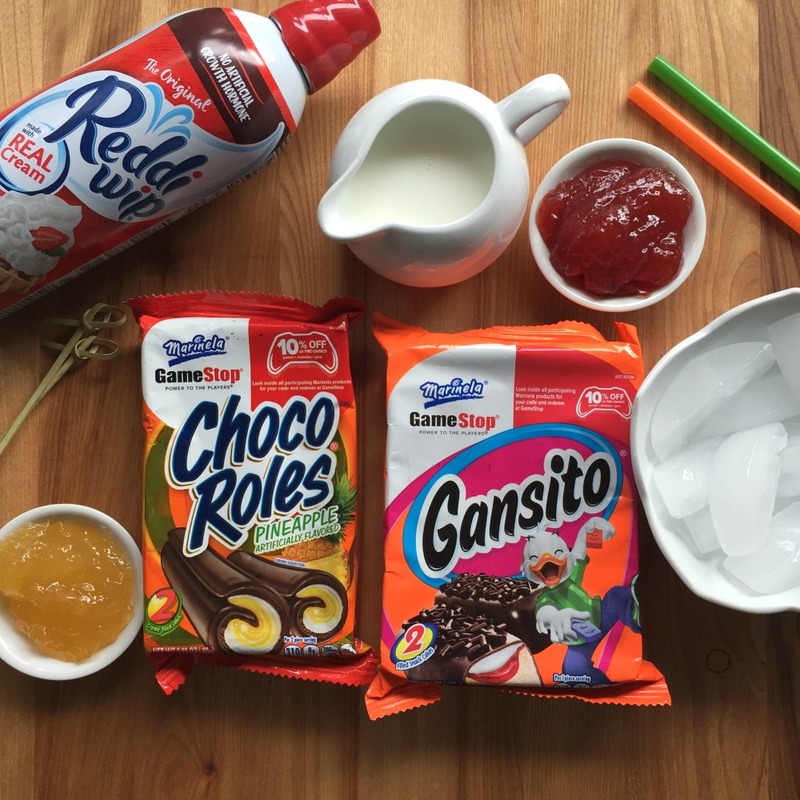 Growing up in Mexico one of my favorite treats were “ gansitos” and “ choco roles” so the other day while shopping I found both treats and thought would be tasty to make Mexican milkshakes using both flavors and adding ice cream and whipped cream. The result was an indulgent shake full of great memories and bringing back the child in me. Do you have a treat that makes you feel like a child again? 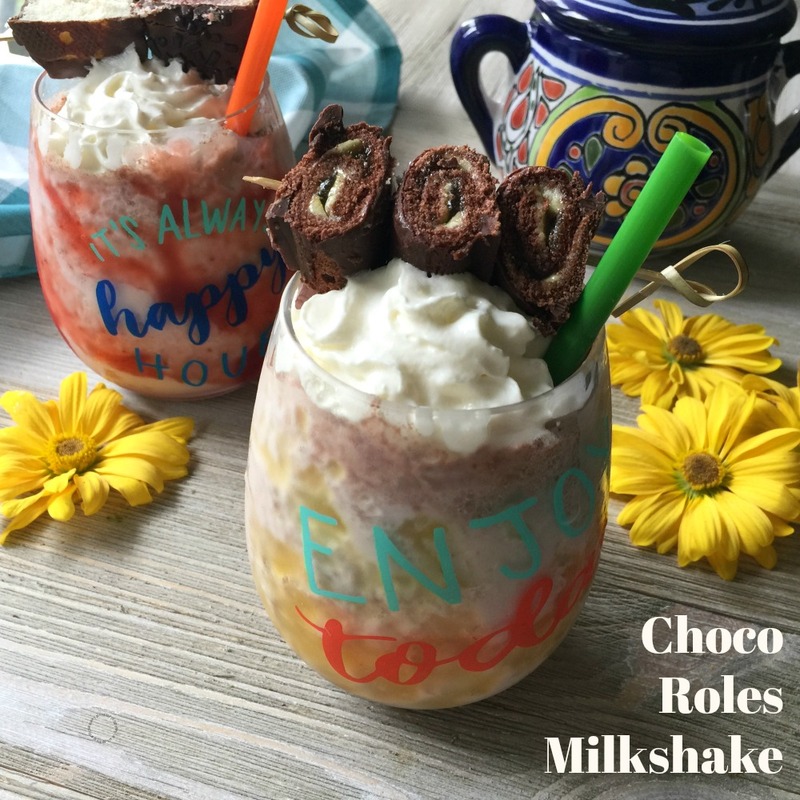 The Mexican milkshakes are a sweet tasty drink that you can share with all the family. 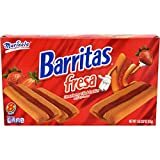 The one made with the “gansito” has strawberry marmalade and the one made with the “choco roles” is accented with pineapple jelly both blended with whole milk and vanilla ice cream for a frothy texture. Then topped with whipped cream for a festive look. These milkshakes are pure indulgence! 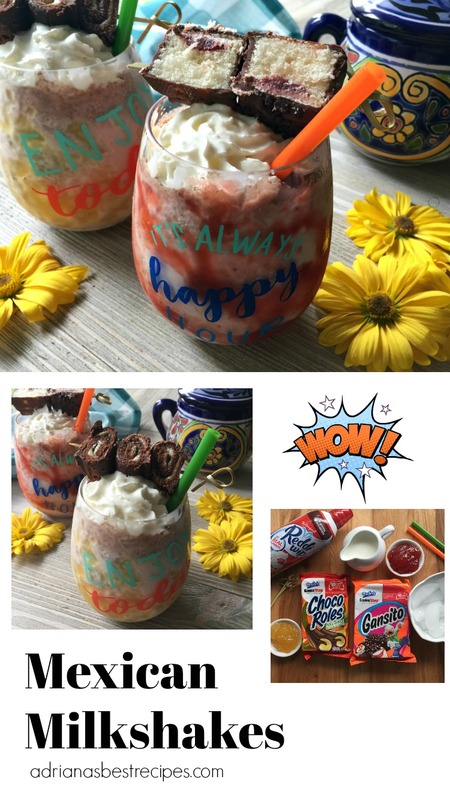 From time to time we deserve to indulge just a little and since Hispanic Heritage month has started there is nothing better than to cheer with a Mexican treat or try my other Mexican milk drinks all delicious options to curve the urge for the sweet tooth while embracing childhood memories. Since I remember, these Marinela products have been part of school years. 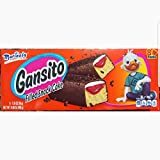 The break or “recreo” at school wasn’t complete without enjoying either the “gansito” or the “choco roles”. If you are Mexican, you understand what I mean. Here in the United States, there are similar products like the Hostess Swiss Roll and other cakes that are common in the school lunchbox. Sometimes we do not realize, but the food that we grow up eating becomes part of our memories and special moments. 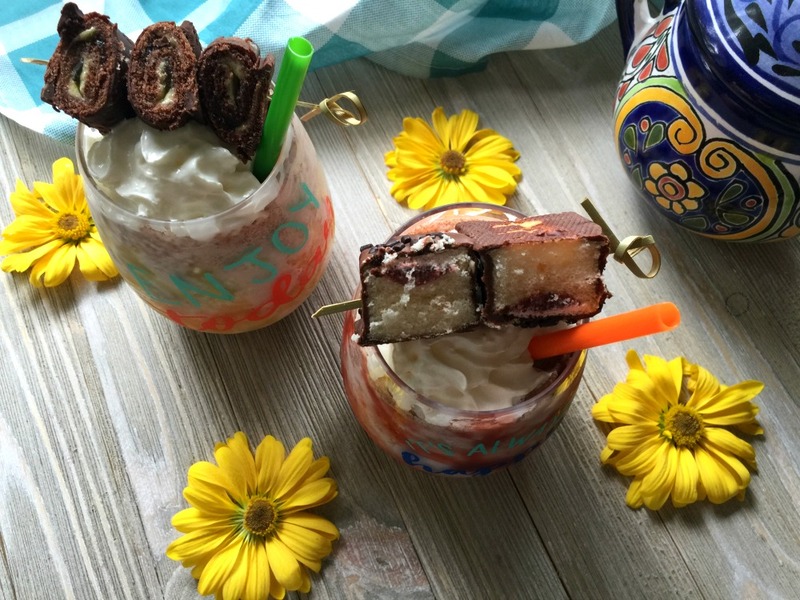 There is no doubt that these Marinela tasty treats while not the best option regarding nutrition was a sweet treat that became a staple of my childhood and now I can bring back via this recipe for the Mexican milkshakes. Are you ready to try them? 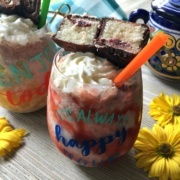 The Mexican milkshakes are a sweet drink that you can share with all the family. 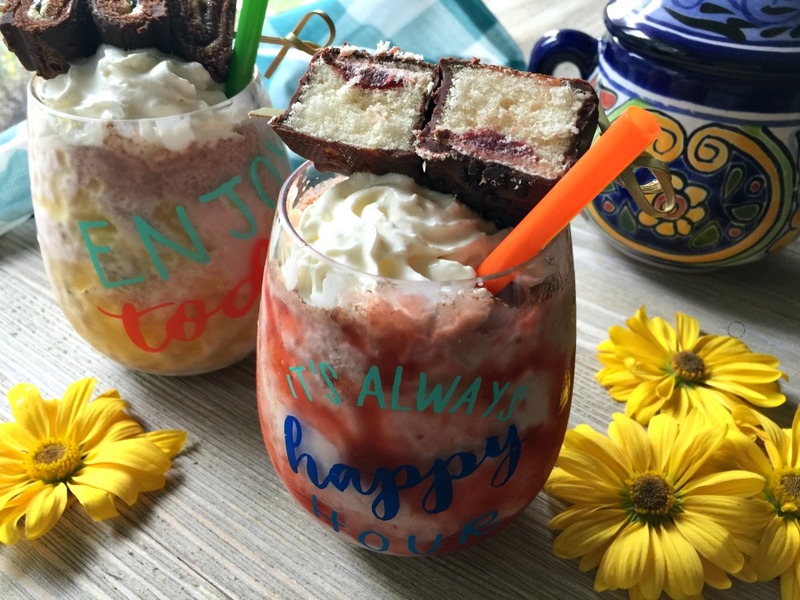 The one made with the "gansito" has strawberry marmalade and the one made with the "choco roles" is accented with pineapple jelly both blended with whole milk and vanilla ice cream for a frothy texture. Then topped with whipped cream for a festive look. Cut one Marinela Gansito into two pieces and add to the blender along with one cup of milk, one scoop of vanilla ice cream, few cubes of ice and blend. Cover the inside of the glass with strawberry marmalade. Pour the milkshake into the glass and garnish with whipped cream, few pieces of cake and a wide straw. Cut one Choco Rol from Marinela into three pieces and add to the blender along with one cup of milk, one scoop of vanilla ice cream, few cubes of ice and blend. Cover the inside of the glass with pineapple jelly. Pour the milkshake into the glass and garnish with whipped cream, few pieces of swiss roll and a wide straw. You can replace the vanilla ice cream with chocolate ice cream for a more chocolatey experience. In case the Marinela products cannot be found in your market look for other cake treats from Hostess and replace with your favorite. 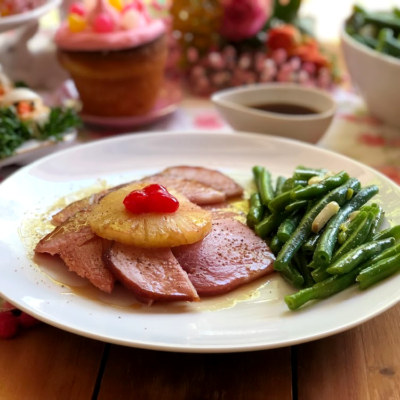 This recipe adapts to many different flavors. So many interesting flavors! Really takes the boring milkshake up several notches! I also really want to try these treats without ice cream. Oh my goodness, I’ve never seen anything like these before! They look delicious!! Now that is a piece of heaven will surely satisfied my cravings for sweet. I never tried Mexican milkshake before this could be interesting. These are milkshakes that I just know my kids would adore! They look so deliciously indulgent, I’d be tempted to drink it myself before giving them to the kids! These look and sound delicious. I have never heard of Mexican milkshakes before so thank you for introducing me! Definitely something worth trying in my opinion. Indulgent is the perfect word! 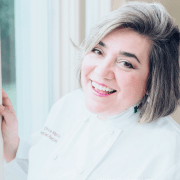 I have such a sweet tooth, and this delicious recipe looks right up my alley. Oh my gosh, that recipe sounds delicious! Thanks for sharing it. Definitely a twist on the traditional milkshake. I certainly have sweet tooth. I have to try those! Wow! This Mexican Milkshake is mouthwatering and it’s calling my name!!! This is so yummy for sure and I will definitely try this! These look good. 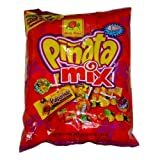 I love going down the Mexican aisle at the grocery store and picking up some of these treats. I love milkshakes. I make them almost every day. 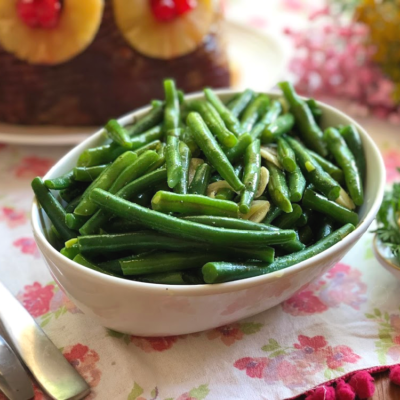 It is a healthy and refreshing summer treat. What a great recipe. 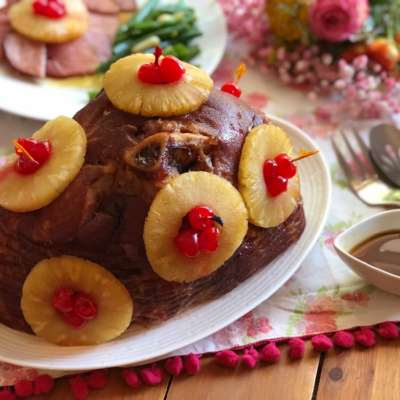 I love the addition of the pineapple jelly. Your milkshake sounds AMAZING. My teen would love it but he loves all kinds of Mexican food. With that said, I’m going to have to look at your recipes and make him something for him. Are the chocolate snacks very sweet? I’ve noticed that desserts outside of the United States are less sweet. 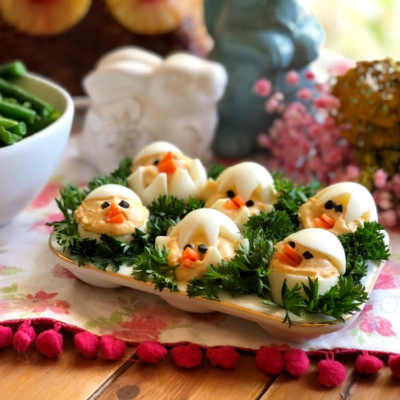 These baked treats are manufactured in the USA, Marinela is a huge company, and they have expanded to this market and beyond. The Gansito and the Choco Roles are sweet that is why I do not add any additional sugar to this milkshake. Wow this is milkshake has it all. 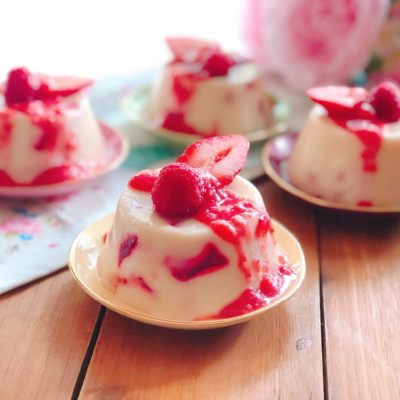 My sweet tooth loving family will love this recipe!